The National Oilwell ("O.W.E.C.O.") 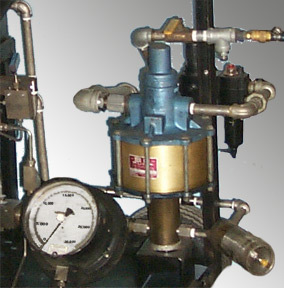 well head test rig A below, was re-deployed to 11,500 psi methanol and INHIBITOR pumping, to prove injection ysstems. The fast return / suction stroke of pump B prevented the suction from fully filling. The discharge stroke began with a huge acceleration until the plunger hit the liquid and sent a shock intot he system. 1. The rpessure set valve C was blasted off its seat. Metric Pt.#- PigLP / 0.25 Lt. / 40 Br. / 1/2" x 3/8"
Just one of 1000 items "of fthe shelf" Inventory. 2. 225% increase in pumpable rate. 3. A year before recalibration required. An example is a direct motor driven three plunger 2500 psi wash pump - below. Vibration of the high pressure cleaning lance from pressure pulsation, made it imporssible for the operator to clean for more than 2 house. After fitting the FLOW-THROUGH PipeGuard Pressure Pulsation Interceptor, the two hours waiting time per day, for circulation to return to the hands, was saved. The PipeGuard damper paid for itslef in two and a half days. AND: Pump life between service was tripled. Pig/ss/LP/15i/600p/0.375" x 0.50" to pmp.